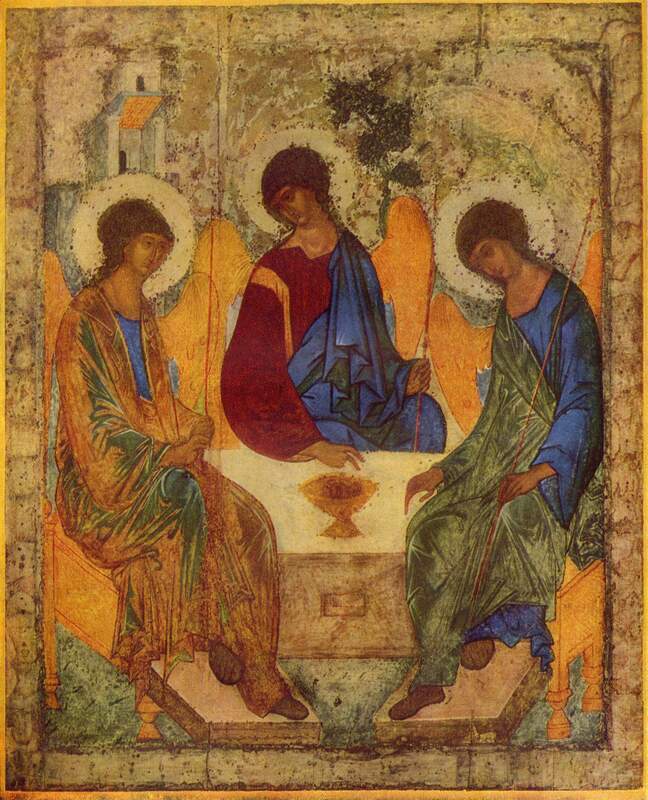 This is Iconographer Andrei Rublev’s ( Андре́й Рублёв) famous work on the Trinity – Angels at Mamre ( Holy Trinity). For those of you familiar with his art, the colour explication that follows is superfluous. What I would really like to share with you is my (re)discovery of these colours yesterday through Tarkovsky‘s lens. These colours become so alive at the ending of his movie Andrei Rublev (1966) after three hours of black and white! Pay particular attention to https://www.youtube.com/watch?v=FsEbrhv2jGY, esp. 4:50′ to 8:00′. For those of you who are not familiar with this icon, Rublev gives each person of the Trinity different clothing. On the right, the Holy Spirit has a garment of the clear blue of the sky, wrapped over with a robe of a fragile green. So the Spirit of creation moves in sky and water, breathes in heaven and earth. All living things owe their freshness to his touch. The green mantle of the Spirit, scintillating with light, is clearly a Rublev achievement. Green belongs to the Spirit because the Spirit is the source of life. The Son has the deepest colors; a thick heavy garment of the reddish-brown of earth and a cloak of the blue of heaven. In his person he unites heaven and earth, the two natures are present in him, i.e., human and divine, (and this is why on the table are placed two of his fingers) and over his right shoulder (the Government shall be upon his shoulder) there is a band of gold shot through the earthly garment, as his divinity suffuses and transfigures his earthly being. The red signifies his earthly passion, and the gold band, his royal status as Christ the King. The Father seems to wear all the colors in a kind of fabric that changes with the light, that seems transparent, that cannot be described or confined in words. The Father’s ghostly outer garment hints at his inconceivable divine nature. And this is how it should be. No one has seen the Father, but the vision of him fills the universe. His robe is iridescent, shifting from glowing golden-red to azure blue, a triumph of the painter’s art. “You robe yourself in light as in a garment” (Ps 104:2). The wings of the angels or persons are gold. Their seats are gold. The chalice in the center is gold, and the roof of the house. Whether they sit, whether they fly, all is perfect, precious, and worthy. In stasis, when there is no activity apparent on the part of God, his way is golden. When he flies, blazes with power and unstoppable strength, his way is golden. And in the Sacrifice at the center of all things, his way is golden. The light that shines around their heads is white, pure light. Gold is not enough to express the glory of God. Only light will do, and that same white becomes the holy table, the place of offering. God is revealed and disclosed here, at the heart, in the whiteness of untouchable light, the Uncreated Light. This entry was posted in Film and Animation, Iconography and tagged andrei rublev, Art, Colours, Film, God, Holy Trinity, Icon, Metaphysics, Painting, Drawing and Gravures, Russian, Symbolism, Tarkovski, Theology.